I don’t know of any other food that has such an amazing ability to evoke memories of “home” to me than Chicken Noodle Soup. I adore the combination of the broth, vegetables, and chicken that can conjure up visions of snowy stay-at-home days or lazy fall lay-around days. It’s getting to be about that time of the year when my crock pot and my soup pot both get a workout… when dinners are made the night before and the house seems steeped in the fragrant mirepoix of celery, carrots, and onion. 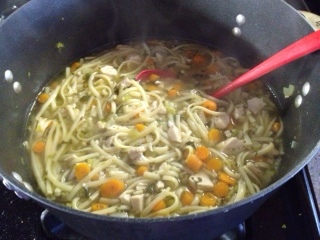 Today was one of those days when I just needed to make Chicken Noodle Soup. M is home sick and wants to eat soup… so, of course, I wanted to make it from scratch. He will agree when I say that he makes a lousy patient. He doesn’t like to be sick and hates not having enough energy to do much of anything, so my thought is to make something that tastes good and has wonderful healing properties (http://en.wikipedia.org/wiki/Chicken_soup) to make M feel better as soon as possible. As with most of my recipes, this is definitely a “Use The Force” recipe. I start with my big soup pot. This thing can easily hold an entire cooked chicken (picked up cold from the local grocery store) and enough water to cover it… so that’s where I start. I cook the chicken in the water until the chicken is almost ready to fall apart. Remove the chicken to a strainer and allow to cool before picking all the meat off the bones. You now have a very light stock to start your soup. I finely dice carrots and celery and add to the soup. Today, I used a few hands full of baby carrots and the inside pieces of a stalk of celery as my mirepoix… M’s not a big fan of onion, so I didn’t include it today. I then diced some of the chicken breast into fairly small pieces. I saved most of the chicken for other uses but a total of one breast, sliced and diced, was enough for this entire pot of soup. I allowed the vegetables to cook for awhile and then adjusted the seasonings… adding salt/pepper, a little par sley and lemon thyme, and then included four packets of G. Washington Golden Bouillon (my favorite from childhood). Since M wanted “noodle soup”, I broke up about an inch-width of linguine into four pieces to simulate the name brand’s noodles… now it just needed to cook the noodles. Once everything was incorporated and the noodles had plumped up, I added about a half cup of Reserve Chardonnay from James River Cellars Winery. I could have used any white wine, but I really like the way Chardonnay cooks and it adds a really lovely back note to the broth. This made my chicken noodle soup taste amazing. I hope you’ll try your hand at making your own version of Chicken Noodle Soup, especially if someone you love isn’t feeling up to par. It might be just what the Doctor ordered!